Here’s the post I know that a lot of you have been waiting for. 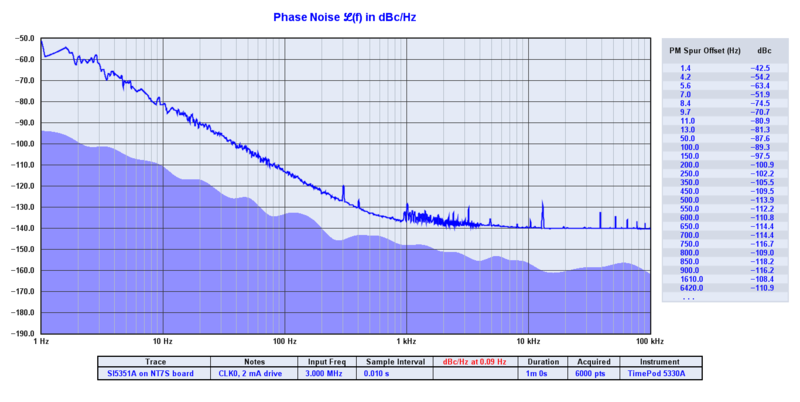 Buzz around the Si5351 has been picking up at a pretty rapid clip over the last month or so, but a lot of homebrewers have been hesitant to use it in their designs because one critical parameter has not yet been measured: phase noise. 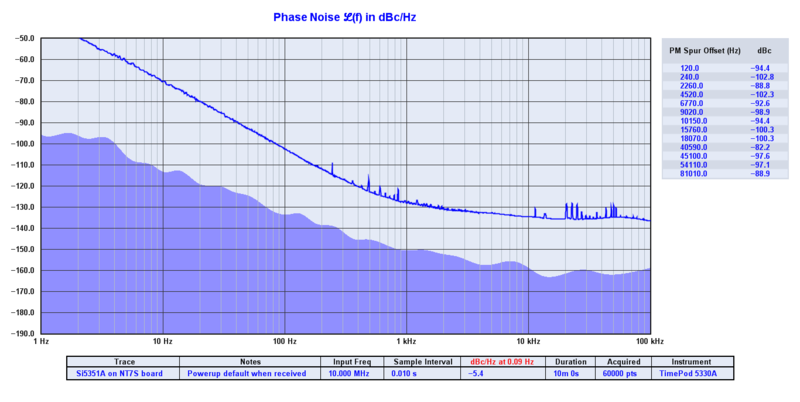 Phase noise measurements seem to be one of the least easily accessible to the typical ham homebrewer, but fortunately for us, we have in our ranks some engineers with access to excellent T&M gear that most of us would never be able to afford for our home workbench. Thomas LA3PNA was able to put me in touch with one such engineer, John Miles KE5FX. 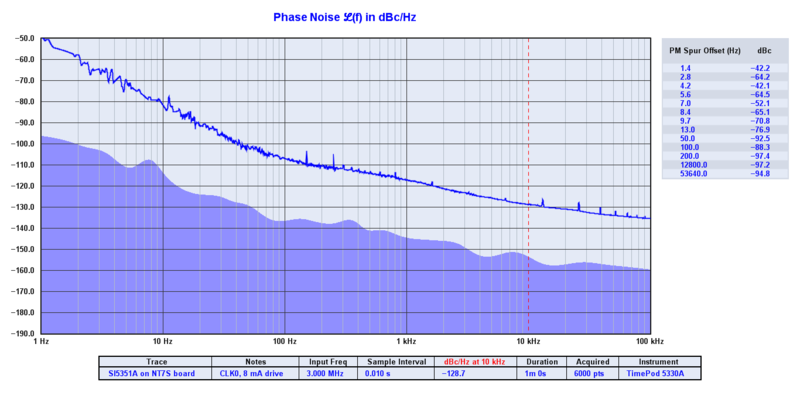 I don’t know much about John, but I should, as it looks like he has developed the TimePod phase noise measurement device and the TimeLab analysis software (which is very slick, I must say). John was generous enough to make a variety of phase noise measurements on the Si5351A Breakout Board that I sent him. 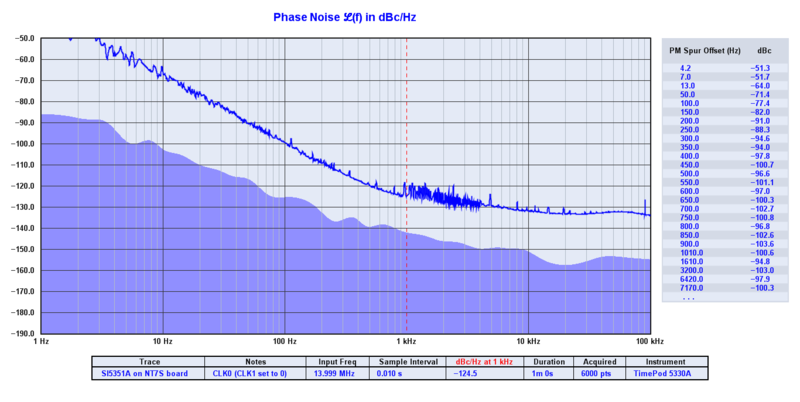 Below, I present some plots of the phase noise measurement that were taken at various frequencies and under a few different conditions. Before I get to a brief commentary, here are the plots. 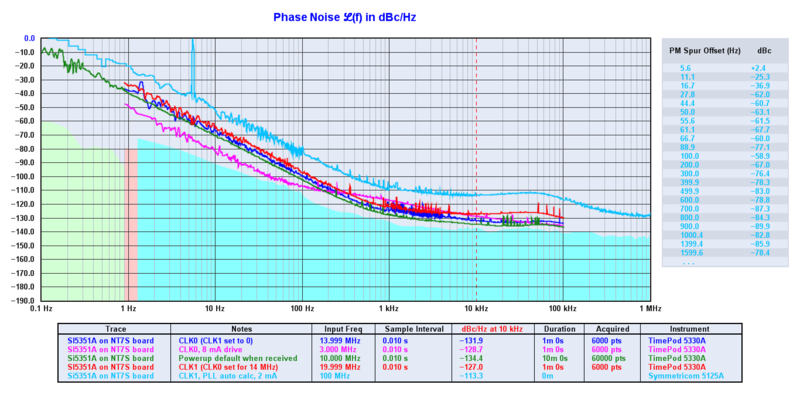 The first two plots were taken at 3 MHz, first with 2 mA output current then at 8 mA output current. Then you will find 10 MHz, 13.371 MHz (in both fractional and integer divider modes), 14 MHz, 100 MHz, and then a composite plot of all of the different traces. I believe that the plots speak for themselves fairly well. If you compare these results to the receivers in the Sherwood Engineering receiver table, I think you’ll see that the Si5351 acquits itself quite nicely for such an inexpensive part. Personally, I think the Si5351 is eminently usable for many receiver applications, except perhaps the most high-performance. Certainly for the price, it’s going to be extremely hard to beat. I hope this motivates those sitting on the fence to decide if the Si5351 will meet their needs. I would like to sincerely thank KE5FX for taking the time to make these measurements for the community and for allowing me to share them with you. 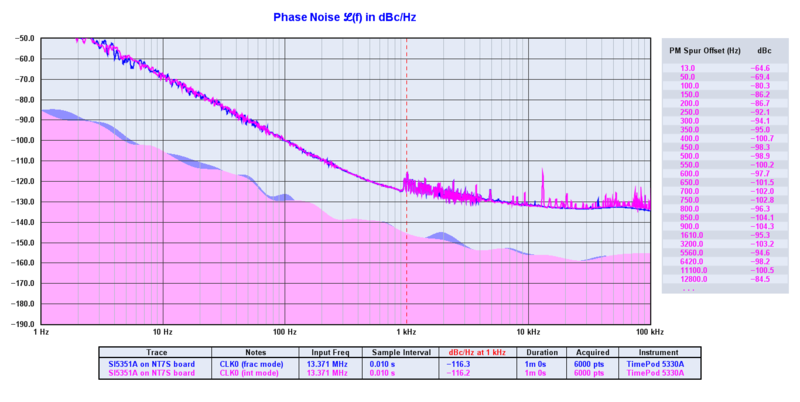 If you have any ideas for critical phase noise measurements that aren’t included here, let me know in the comments and perhaps we can get those made as well. Edit: I failed to mention that these measurements were taken with a plain old 25 MHz ECS crystal as the reference oscillator. 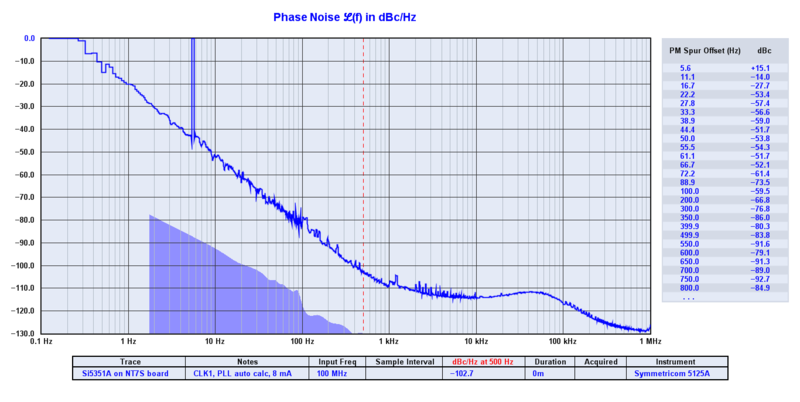 With a higher-quality reference oscillator, one would expect even better phase noise performance.